Florentine Lantern. Custom chandeliers. High end chandeliers. Renaissance architecture is the architecture of the period between the early 14th and early 17th centuries in different regions of Europe, demonstrating a conscious revival and development of certain elements of ancient Greek and Roman thought and material culture. Stylistically, Renaissance architecture followed Gothic architecture and was succeeded by Baroque architecture. Developed first in Florence, Filippo Brunelleschi as one of its innovators. Renaissance style emphasized symmetry, proportion, geometry and the regularity of parts. This it took from the architecture of classical antiquity and in particular ancient Roman architecture, of which many examples remained. Orderly arrangements of columns, pilasters and lintels, as well as the use of semicircular arches, hemispherical domes, niches and aediculae replaced the more complex proportional systems and irregular profiles of medieval buildings. Italy of the 15th century, and the city of Florence in particular, was home to the Renaissance. It is in Florence that the new architectural style had its beginning, not slowly evolving in the way that Gothic grew out of Romanesque, but consciously brought to being by particular architects who sought to revive the order of a past “Golden Age”. The scholarly approach to the architecture of the ancient coincided with the general revival of learning. Award-winning designer Shah Gilani, ASFD, based the design of his Florentine Lantern on this historical backdrop. The luminaire was designed for use in foyers, entryways, hallways, and breakfast nooks of upscale residential and hospitality interiors. 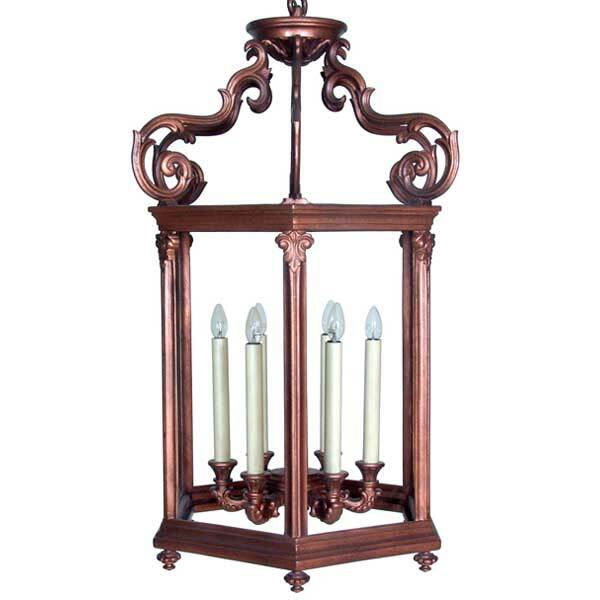 The light fixture is offered in a variety of finishes and accents. Custom sizing is available.